My dad made a duck. He used to make all manner of things for our kids, in the same trademark “folk” style which could never be mistaken for the work of someone for whom the fun of the project was in fine finishing and exquisite detail rather than in the sheer joy in the doing and in watching the end user at play. His simple duck had three moving parts, commonly called wheels, and two other bits somewhat rudely carved and clear varnished. 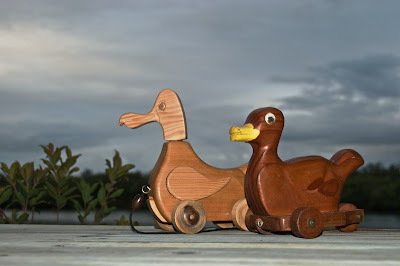 The back wheel had an eccentric axle so that as the duck was pulled along, it’s tail bobbed up and down, giving the impression that it was waddling, at least when it was on a carpeted floor. When it wasn’t it didn’t work, but that never seemed to be noticed by anyone pulling it along. I am my father’s son in that I seem to share his uncontrollable urge to build things that could easily be produced in a factory, but I just can’t seem to manage the same simplicity and timeliness that he achieved. I always need to overcomplicate things, or make them “better” when there’s no need. So when I make a duck, it isn’t a duck, it’s a “seabird”, and it isn’t made from a total of five pieces, mine has twenty-four parts and they all had to be assembled in a particular order. All of that means of course that it didn’t actually get finished in time for the first birthday as planned, it took a mere extra year! It does have a head that wags from side to side with a satisfying clatter, but it seems to have a strange vulnerability at the very point that pivots. I suspect that thirty years from now, it will by my father’s version which will have survived another generation complete with it’s one broken eye or perhaps by then with two, to be copied by one of my grandchildren’s parents for their own next generation. Incredibly Sebastian turns two this week, and he’ll have a duck of his own, a mate for his mother’s, and she’ll have hers back after a few decades of slumber in a box in our ceiling! I wonder who will be the most impressed. I must say, reading your blog before receiving the present may take an element of surprise away! But 10 points for having it ready for this birthday, I can't wait to see it in real life. Yeah! I thought that for a moment, and then I thought: If he can't speak yet, how will he find my blog and read it?